This is another one of those recipes that has been in my drafts for quite sometime now. I had made and photographed this dessert almost a month ago. I even managed to edit the photographs. But I never got around publishing the recipe because the writer's block always gets the better of me. Each time I sit down to pen my thoughts, I find myself with a lot on my mind. None of which renders to a compelling blog post. I wonder how some people manage to pen their thoughts so effortlessly. This is something I really need to learn. Enough of my woes about writer's block!!! Let's get to the recipe. Shall we?? This parfait was something that I had made a few weeks back. I had some raspberries lying in the fridge and there were also these store brought Oatmeal raisin cookies that the husband and the kiddo didn't fancy too much. 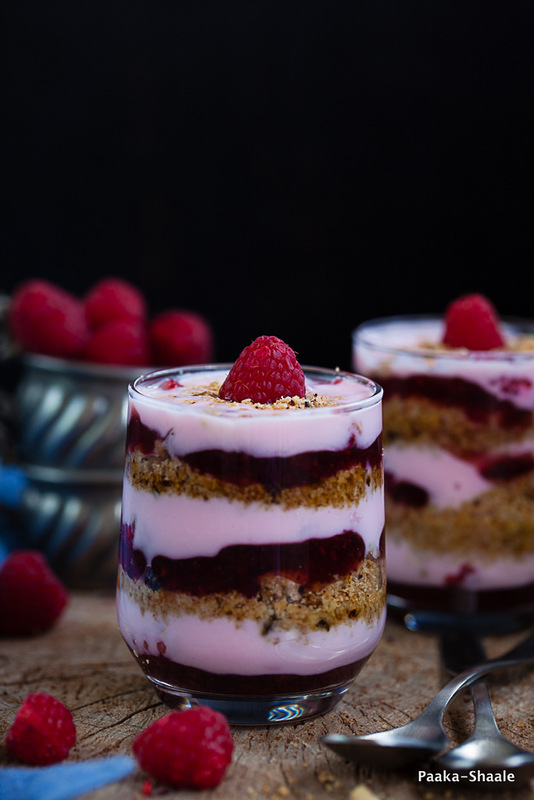 So I decided to combine the cookies and the raspberries to make this Parfait. To me, nothing screams spring quite like berries. According to me, summer/spring desserts should be simple, fresh and quick to put together. And that's what this Parfait is all about. Uncomplicated and delicious. 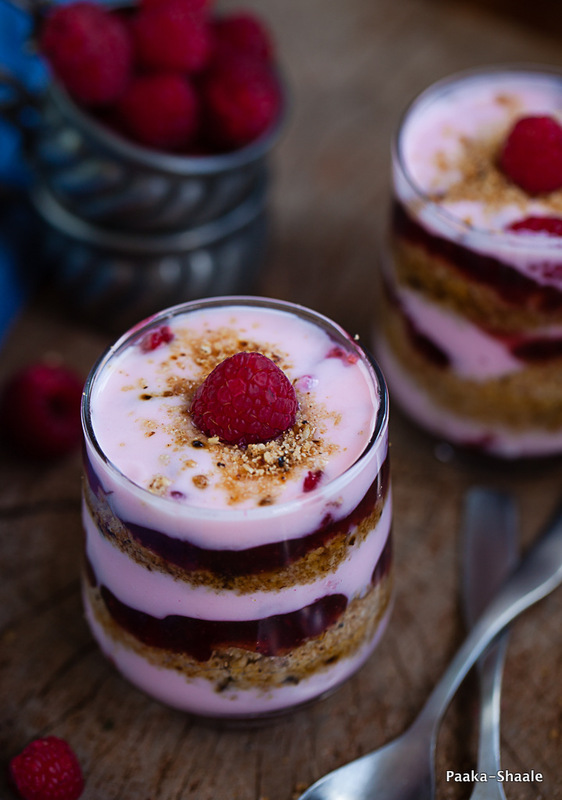 Fresh raspberries, strawberry yogurt and crispy oatmeal, raisin cookies, A combo that is just perfect for summer. Like many of my previous recipes, this one is also very versatile. 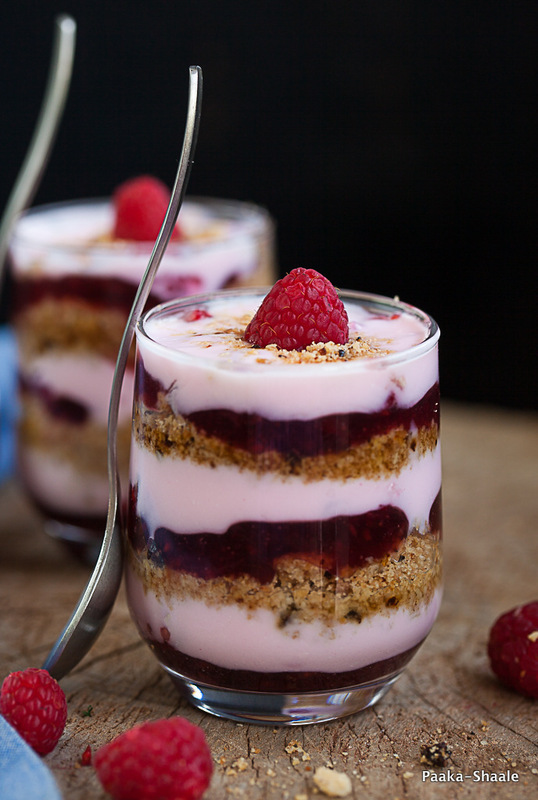 This parfait can be made in a hundred different ways to suit your taste. 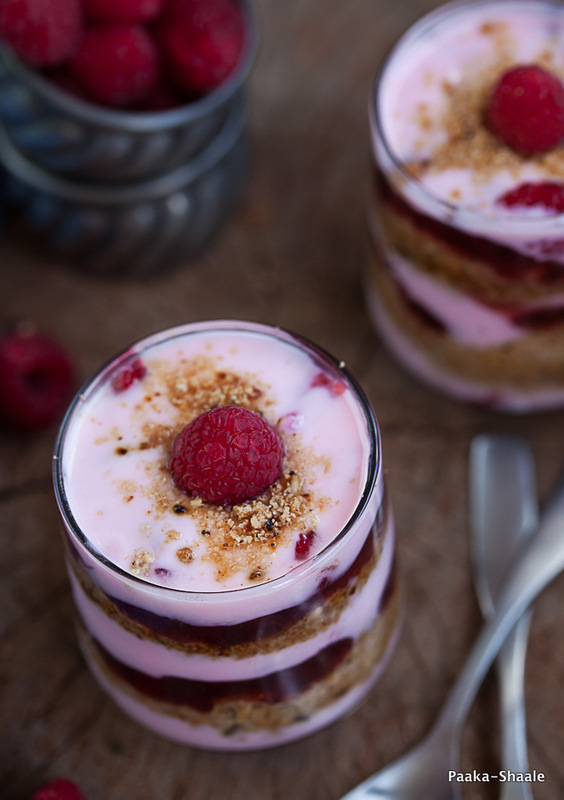 The raspberries can be replaced with a different kind of berry or fruit. The crumbled cookies can be substituted with granola and the yogurt can be replaced with whipped cream for a richer version. Trust me, the chances of going wrong with this dessert is almost nil. 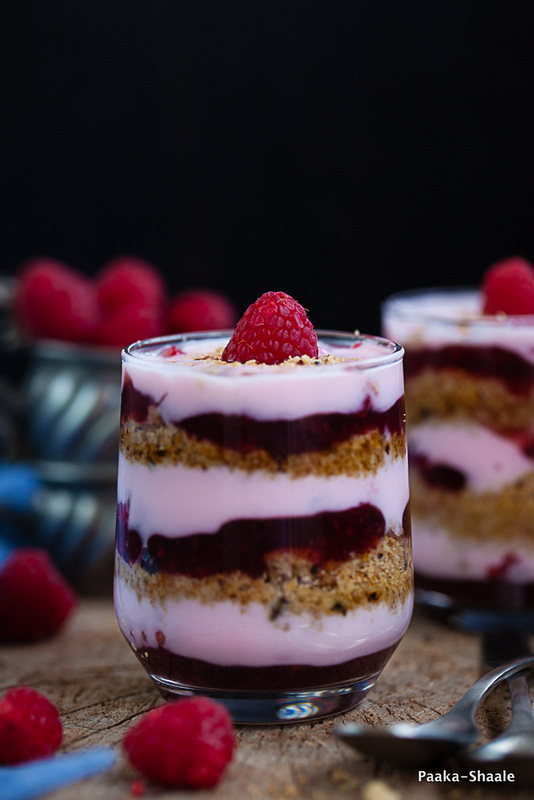 This parfait is just perfect if you are looking for a quick dessert!! This will leave your sweet tooth satisfied without making you feel guilty!! 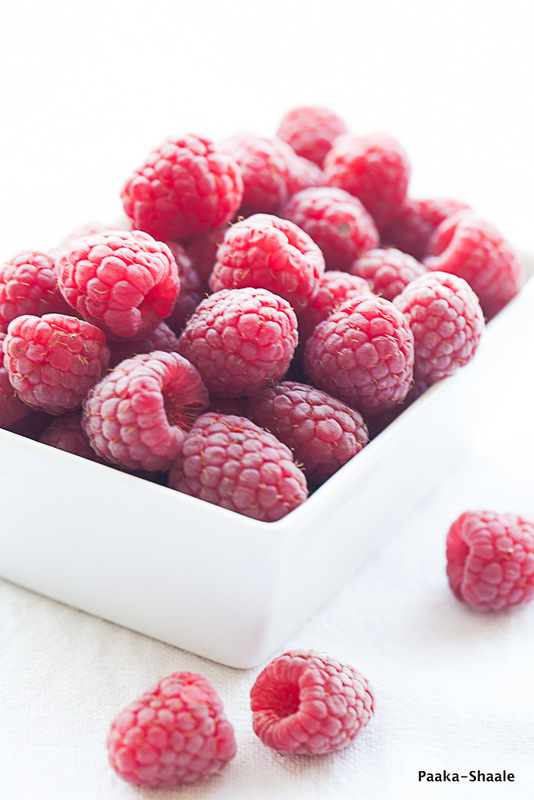 Combine 6Oz of Raspberries, sugar and water in a sauce pan and cook over low heat for 2-3min. Mash the berries with the back of the ladle or spoon and continue cooking for a 3-4min more. Take off the heat and allow the compote to cool completely. Blend the oatmeal raisin cookies to a coarse powder in a blender and set aside. Chop about 8 raspberries into quarters and reserve the rest for garnishing. Spoon a table spoon of the compote at the bottom of a clean shot glass. 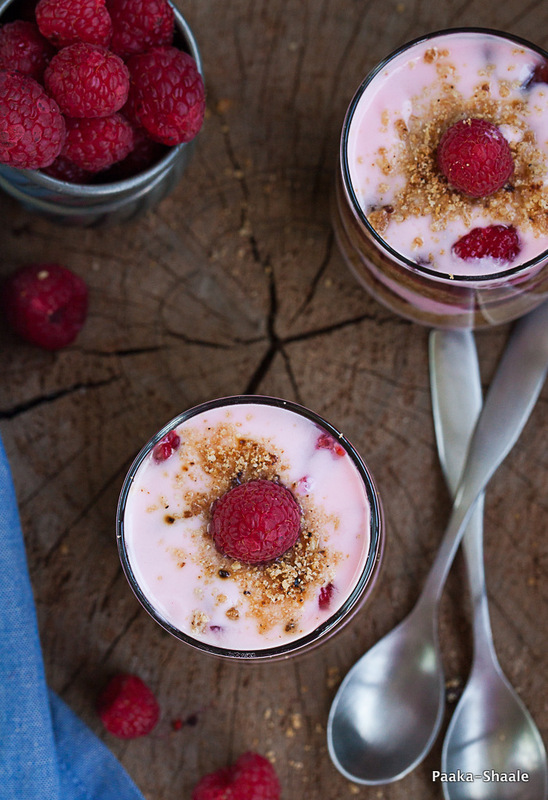 Proceed by adding a teaspoon of chopped raspberries and follow it up with one and a half table spoon of Strawberry yogurt. Then top it with a layer of crumbled cookie and press slightly. Repeat the process until the glass is full and Top it with a raspberry. Chill the parfaits for an hour before serving. I did not add too much sugar to the compote because I did not want to make the parfait overly sweet. But you can go ahead and add more sugar to adjust the sweetness. You can made this dessert with berries of your choice. The oatmeal raisin cookies can be substituted with Granola. You can add some nuts if you prefer! !